History was made in the office of the WSU student body president this past academic year—literally. 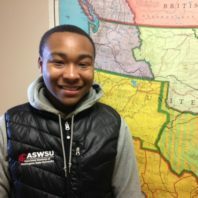 History major Jordan Frost completed his term as ASWSU president in May 2018, finalizing a journey that began in the fall of 2013. President Frost’s academic story is one that could rival the best Horatio Alger yarns. Jordan admits his academic journey got off to a “shaky” start, but five years later, he now finds himself in possession of a WSU diploma with a degree in history. And just because Jordan completed his undergraduate degree, it doesn’t mean his academic career is over. Beginning this month, he will continue his education toward a master’s degree in teaching social studies. His goal: to return home and teach history and/or social studies at his high school alma mater, Kent-Meridian in Kent, Washington. The skills Jordan learned and developed as a WSU history major served him well while he was president. “Critical thinking,” Jordan said, was among the top learned “history skills” he employed as president. “Being able to know which information is valuable is really key. Just like in history, being able to evaluate a source is really important. Jordan’s history-major approach to being president also added to a bit of clutter in his desk. “We had all sorts of reports on shelves, going back years and years,” he said. “Many of my predecessors looked at it as ‘old stuff’ and they didn’t take much value from it. But I knew how to evaluate it. I took the reports down and put them in the drawer of my desk where I could consult them. It was just like doing a history report, like in History 300 or History 469. It’s not unusual for WSU students to bring back souvenirs from summer travels abroad, but junior Jacee Thompson may have taken the “bring-back-a souvenir” concept to another level. When the chance arose last summer to travel with family members to Africa, it was an opportunity too good to pass up. 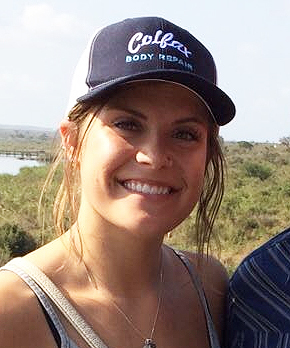 A history major, Thompson, 21, knew traveling abroad would expand her knowledge of the world and help strengthen her foundation for success in the classroom. 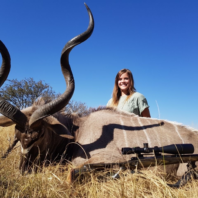 Thompson’s two weeks in South Africa included flying into Johannesburg, traveling to the judicial capital Bloemfontein, and visiting the famous South African game reserve, Kruger National Park. Thompson, who by her own admission is a “pretty good shot,” has hunted deer locally near Kamiak Butte for years.